Display your plates, small platters, tiles, pictures, magazines or cutting boards in this iron tiered plate holder. 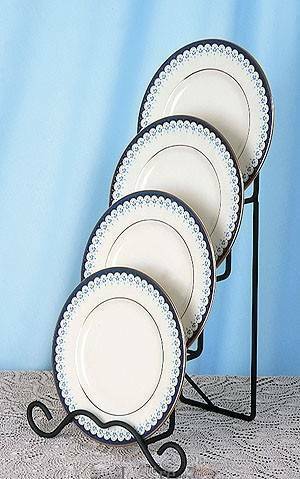 This tiered stand will hold four 8.5â€³ to 11â€³ plates. Overall height is 17 1/2â€³ while depth is approximately 8.5". This is a great way to display multiple items when you don't have much counter or tabletop space!